A slow start to the day since Jake and the Underground Bicycle Shop of Redway aren’t scheduled to open until 10:00. I ate breakfast and made friends with some of the 70-odd (figuratively and literally) people at the campground for a family reunion. We rode back uphill the mile to Redway around 9:00 and I went to the market for some oatmeal, trailmix and fruit while the boys ate breakfast at Deb’s. At 10:00 we stopped back to see if Jake was coming to work (shop hours 10:00- 5:00 W-F). Nope. A call determined that Jake was at a music festival in the Sierra’s. Shocking… Next bike shop is in Fortuna, too far to make today. 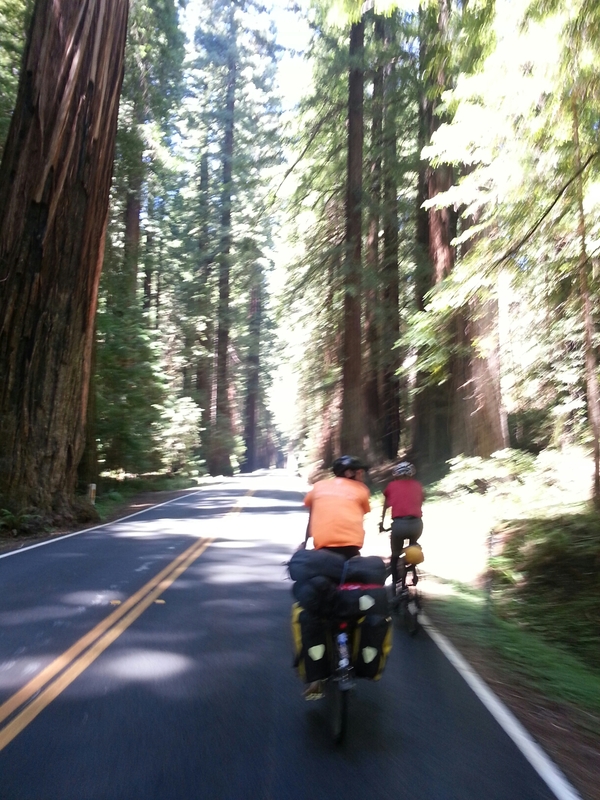 New plan, ride to the Avenue of the Giants camp and bike today, ride to Fortuna tomorrow morning. Back down the hill to pack up our stuff and load Brian’s stuff on Bob and my bikes. An extra 15-20 pounds. It didn’t matter, today was short and mostly downhill. Until Friday, the Big Sur day was my top ride. 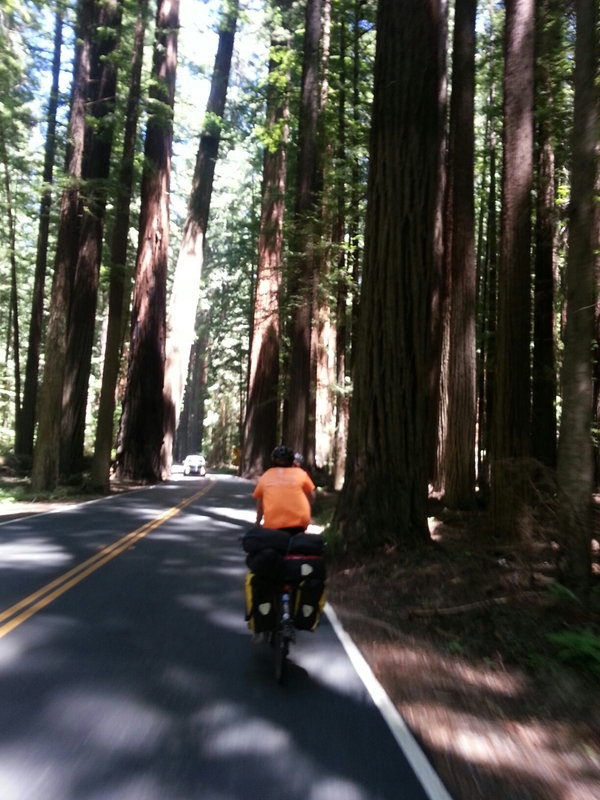 But, cruising down the Avenue, with little traffic, through the canopy of giant redwoods trees was fabulous! 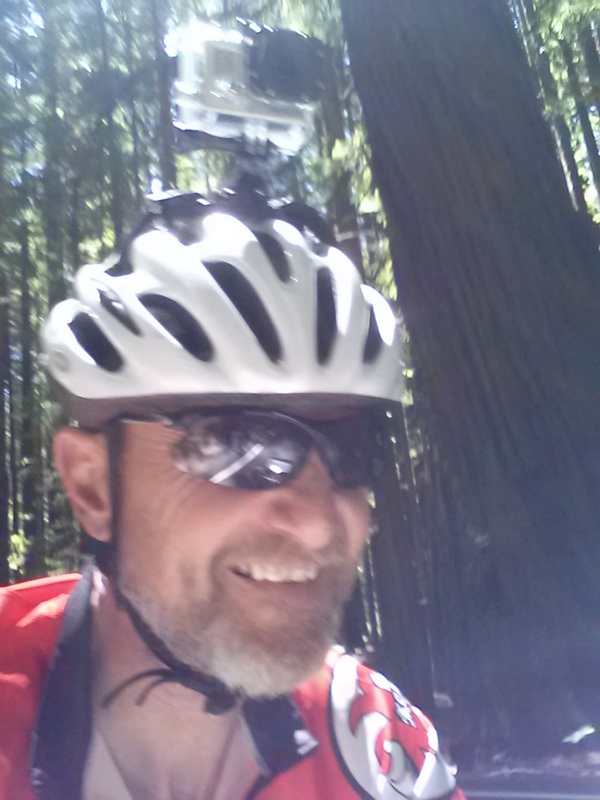 We set up camp at a bike/Bike site in the heart of the Humboldt Redwood State Forest, rode 4 miles to The Founder’s Grove, did a short hike loop and then biked another 4 miles and hiked to see the Giant redwood (national champion), tallest redwood and Flatiron Redwood (for the shape). Almost more impressive were the fallen trees. 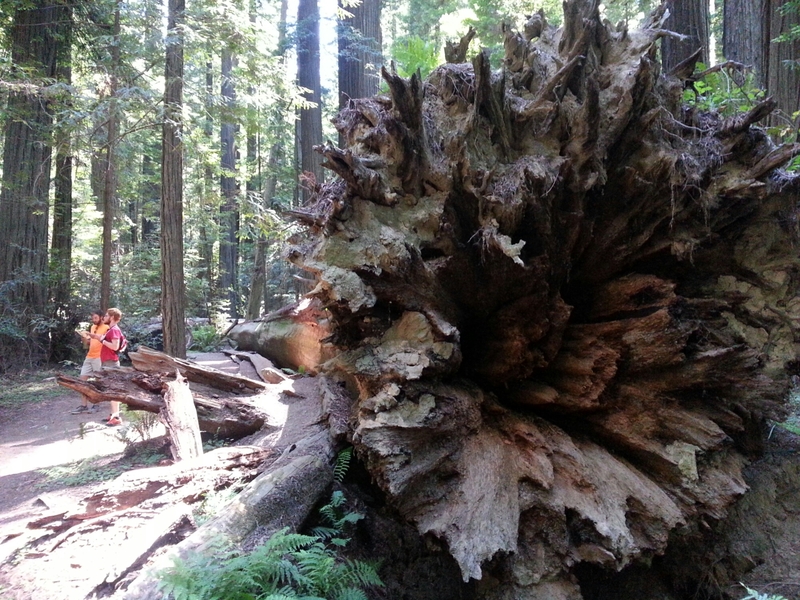 One of them in Founder’s Grove was one of the largest and oldest trees in the park until an extremely heavy rain in March 1991 toppled it. It occurred to me that I probably saw it standing on a family vacation in the 50’s or 60’s. 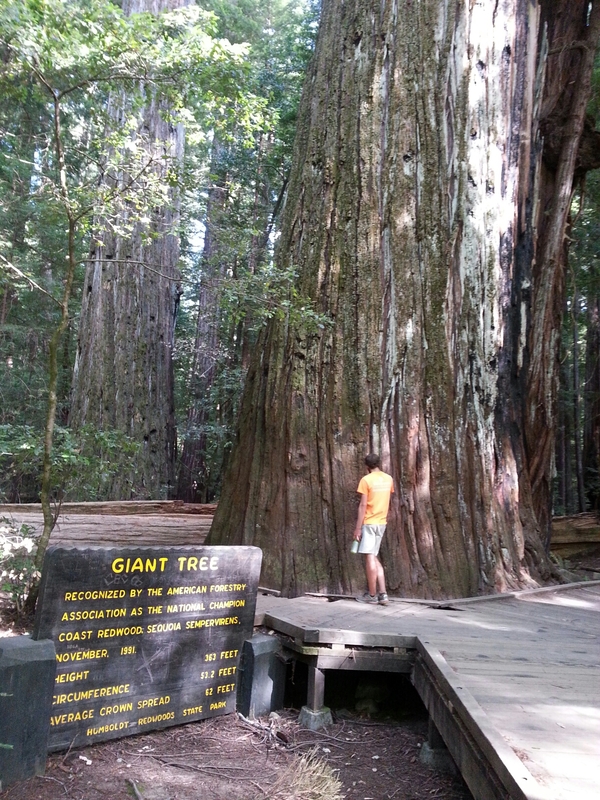 Some pictures while cruising The Avenue of the Giants. Big trees up, Big trees down. Back to the camp where two other solo bikers and one couple filtered in to fill up the sites allotted for bikers. A great day of biking. I’m hopeful we can get Brian’s bike fixed and his gear off of mine tomorrow.